CVM/Romeldale sheep generally have a clean face, although sometimes wool is found on the forehead. The body is sturdy and well-boned, with a long, straight back. Neck and shoulders should be largely free of skin folds. Reverse Badger: All above areas are light instead of the traditional black or brown, and the rest of the animal’s body is dark wool. This pattern can have random light/dark spots also on the animal. ****Using the above traditional CVM markings as an example: If the animal has 5 or more of the 7 traditional markings, it would be considered a CVM. Otherwise, it would fall into a random-patterned and solid natural colored category. 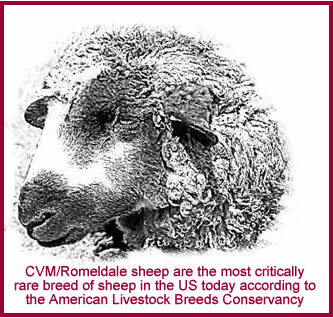 Unlike many colored sheep, CVM/Romeldales will not fade with age, but rather darken from birth to their first year. The other dominant trait in this breed is that the sheep’s wool softens as it gets older. These two traits alone set this breed apart from all others. Strong twinning, particularly easy lambing, superior wool and a desirable meat carcass were all a part of the original breed selection process. CVM ewes are known to breed while still suckling with lambs at their side if exposed to a ram. Ewes are protective, dedicated mothers, prolific and long lived. Rams are aggressive and virile breeders, able to cover more than the standard number of ewes. Annually, each sheep grows an average of 6 to 12 pounds of wool with an average yield of 65%. Fleece should be bright, dense and uniform from front to britch. Staple length averages 3 to 6 inches with a Bradford count of 60 to 64. The wool is soft and can be worn "next to the skin" with a well defined crimp from base to tip with no kemp present. Truly, it is wool developed with the hand spinner and fiber artist in mind.....easy to spin...wonderful to work with....and an absolute delight. No wonder CVM/Romeldale is so sought after by the fiber community.